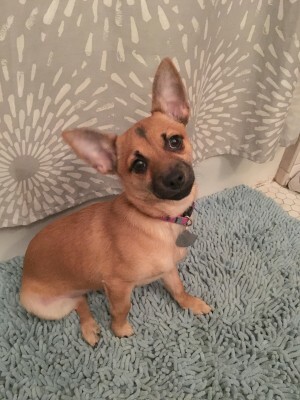 Hello, today I have a little Chihuahua mix from Kansas City's Chain of Hope. She would love to be on someone's lap. Her bio says, "Plum is about a 6 mo. old Chihuahua mix. We don’t know what she is mixed with, but we know she’s cute!!! She weighs about 9 lbs. at this time. She is now spayed, vaccinated and crate-trained. This little girl will even put herself to bed! 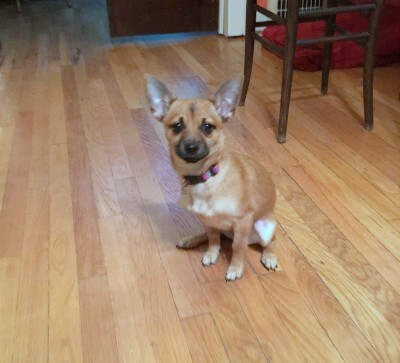 She is in a foster home and progressing very well on her house training, too! 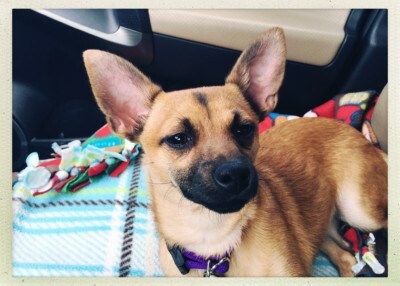 Plum likes to play with other dogs and then she’s ready to cuddle on your lap." I do think she is quite a cutie. Those ears are something else! I will admit, that I was on my usual Poodle hunt and then saw Plum, and decided she was the "it girl" for today. I have two links for Plum if you know of someone who would be interested in her. Her Petfinder Bio is HERE and Chain of Hope's website is HERE. Plum is beautiful and those ears are amazing! Shared and hope she finds a forever home soon. Please know that Lisa and I have decided to end the TT hop. We'll finish out the month of April and then call it quits. Thanks so much for participating! Plum is precious! What a cutie and those ears are adorable! Sharing!